Although rag rugs had been around many years before (one was even found to contain pieces of uniform from the Battle of Waterloo! ), there was a brief revival of rug making in WW2. It served as a useful pastime for men, women and children in war-torn Britain. 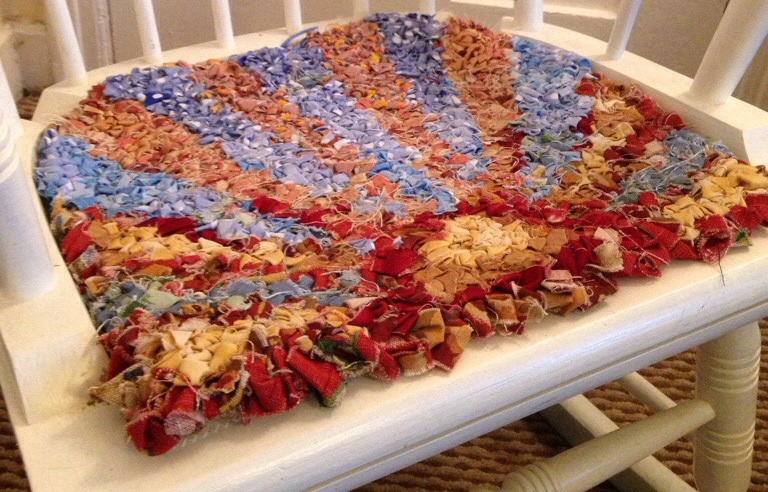 There are many techniques for this wonderful hobby, but whether you poke it through or hook it up, the idea is to use up scraps of fabric, moth-eaten blankets and sheets to create floor coverings, seat pads and the like. Potato sacks (hessian can be bought from haberdashery and craft shops) were used as a base in which to pull or poke fabric strips through. Blunt pointed instruments like large knitting needles, drill bits or nails with wooden handles could be used for poking pieces of fabric through the burlap’s loose weave, creating colourful rugs to cheer up your wartime home. As fabric and clothing were rationed, ‘Make Do and Mend’ was high on the agenda of every household and not a scrap of either was ever waisted. If it was no longer fit for purpose, a new purpose was found to fit! Whether making slippers from hats or rugs from old coats, it was not only a necessity for the home, but also a necessity to keep one’s sanity! Crafts were the perfect way to keep hands busy, the mind focused and away from the horrors, even just for a little while. After the war it became unfashionable to make these rugs as they were associated with poverty and hard times, but luckily this wonderful craft was revived and is still going strong. Why not make a small rag surface protector for putting serving dishes on and test your own creative skills? Side view showing the different types of fabrics used and the textures they create. I went to a quilting fair late last year (I know, how can my life get any more exciting?) and met a lady who did rag rugging and hooking. I bought a rug hook from her and decided to give it a go…but didn’t quite get round to it. Low and behold at Christmas, what should Mama and Papa surprise me with, but a parcel of hessian fabric (I bet the excitement is killing you right now). Did I throw it down in disgust and ask where my pony was? Did I cry and demand an iPad? No, I flipping well went home and started cutting up fabric. 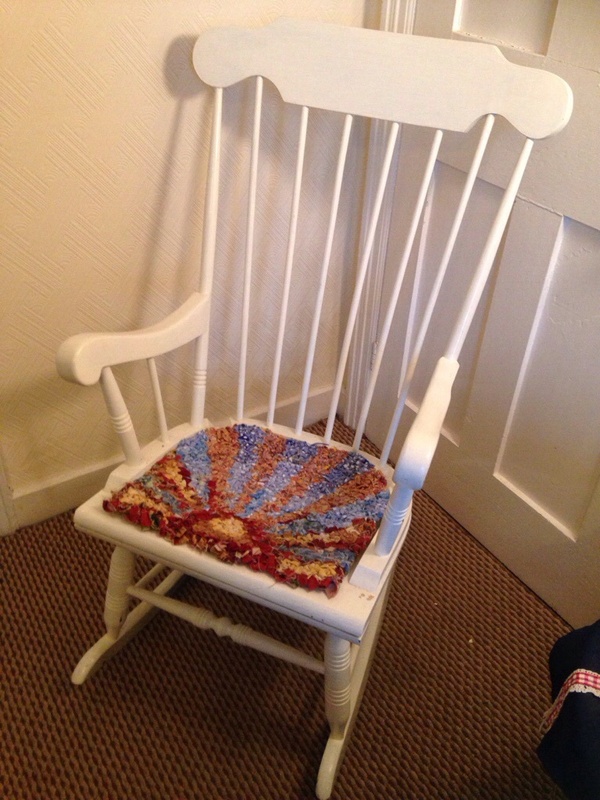 It took me about 5 weeks to do my rocking chair seat cover and I have finished it off by putting a layer of PVA glue on the back to prevent pulling and then a cotton backing. It looks wonderful on the rocking chair! 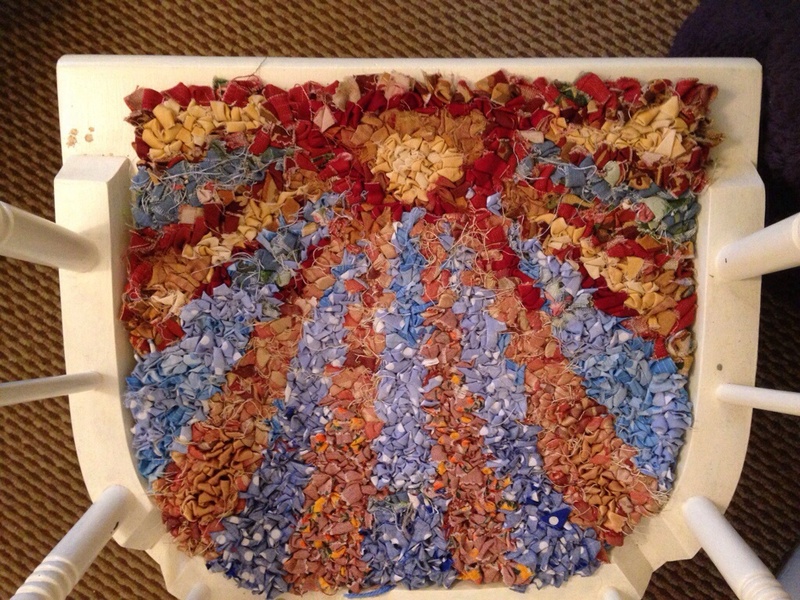 I am now on a much larger project…a rug made out of a kid’s sack race sack. I will certainly post pictures once finished! Posted in Arts and Crafts and tagged crafts. rug making, hook rugs, kitten von mew, kitty pinup, kitty von mew, rag rugs, WW2. Bookmark the permalink.